"Play Together, Win Together in a lottery syndicate from YouPlayWePlay"
Another very good, brand new Lottery Syndicate system about to launch – is the You Play We Play lotto syndicate system based in the UK that covers 4 major lottery games. YouPlayWePlay can proudly claim to be the ONLY lottery syndicate company that offers players the chance to play in totally separate lottery syndicates for the EuroMillions, the UK Lotto, Thunderball and Health Lottery games. Having originally started in 2006 and become highly popular among lotto syndicate players already – You Play We Play has achieved accreditation from lottery regulatory bodies worldwide – and revamped its lottery syndicate platform and re-launched on February 1st 2010. YouPlayWePlay is based in Birmingham in the United Kingdom and offers all lottery players the opportunity to drastically increase chances of winning lottery games by playing as part of either a EuroMillions Syndicate, UK Lottery Syndicate, Thunderball Syndicate or Health Lottery syndicate. Many people are aware that "1 in 4 lotto jackpots are won by lottery syndicates" – a fact stated by the Camelot UK National Lottery – and You Play We Play offers players a really good product that will help them increase the chances of winning the lottery by a great margin. As mentioned – You Play We Play is unique in the lottery syndicate world – in that it is the only lottery syndicate organisation that lets you play in separate lotto syndicates for the EuroMillions, UK Lotto and Thunderball. There are 13 draws every week covered by these 4 major lottery games and players can get up to 50 lines in a draw for as little as 4 pence per line. You can pick your own lottery numbers when playing, meaning that you have full control on your choice – and there is even a Lucky Dip option available where your numbers will be drawn by a random number generator – similar to that offered here at Global Lottery Review. The cost of playing in a You Play We Play lottery syndicate is great value for money when compared to playing any of the National Lottery games by yourself – this will become clear from the comparison table below. The first of the major lottery syndicates from YouPlayWePlay that we’ll look at is the EuroMillions Syndicate. If you play EuroMillions as part of a YouPlayWePlay Euro Millions Syndicate you will get up to 50 separate lines on the Euro Millions draw on Tuesdays and Fridays each week for just 7 pence a line! This in itself dramatically increases your chances of winning a substantial prize on the twice weekly Euro Lottery draw. The Euro Millions Syndicate from YouPlayWePlay consists of a maximum of 50 members – once this is full a brand new syndicate is automatically created. On an occasion when a particular Euro Millions Syndicate may not have enough places – You Play We Play will automatically rollover your entries into the next available syndicate – doubling your chances of winning the EuroMillions jackpot. You can choose your own favourite lottery numbers when playing in a EuroMillions Syndicate with You Play We Play – meaning that you have complete control over the numbers that you select. If you wish to generate some random numbers using the Lucky Dip option – this is easy to do using the YouPlayWePlay random number generator. With You Play We Play – you are able to buy lottery tickets online for just 1 EuroMillions game if you wish – there is no obligation to take out a subscription to play in any further games. So, you can simply buy lottery tickets in your syndicate on a game-by-game basis – however if you do wish to set up a subscription to play in a You Play We Play lotto syndicate over a period of time – this is also easily done. The next of the major lotto syndicates available through YouPlayWePlay that we’ll talk about is the UK National Lottery Syndicate – or to be more precise – the UK Lotto Syndicate. You are also able to play the UK National Lottery as part of a YouPlayWePlay UK Lotto Syndicate and you will – once again – get up to 50 separate lines twice every week in the UK Lotto draw on Wednesdays and Saturdays for just 6 pence a line! As with the EuroMillions Syndicate – this dramatically increases your chances of winning a substantial prize on the twice weekly UK Lotto. The UK Lotto Syndicate from You Play We Play is also made up of a maximum of 50 syndicate members – once this is full a brand new syndicate is immediately formed. If a particular UK Lottery Syndicate should not have enough places available – You Play We Play will automatically rollover your entries into the next available syndicate – doubling your chances of winning the UK Lotto jackpot. Once again – you can choose your own favourite lottery numbers when playing in a UK Lottery Syndicate with You Play We Play – meaning that you have full control over the numbers that you are playing with. If you would prefer to play with a Lucky Dip selection of UK Lotto numbers that is easily done using the You Play We Play Lucky Dip facility – your numbers will be picked by the random number generator available on the website. You can play the UK Lotto in a You Play We Play lottery syndicate on a game-by-game basis if you wish – without having to be tied into any kind of subscription. Therefore you can buy lottery tickets online for just 1 game – however if you would like to have a subscription for UK Lotto syndicate entries over a longer period – this is also available. The third of the major lottery syndicate offerings available from YouPlayWePlay is the UK Lottery Thunderball Syndicate. You Play We Play are the only lottery company in the world to offer players the chance to play Thunderball as part of a lottery syndicate. You are able to play the UK Lottery Thunderball game as part of a YouPlayWePlay Thunderball Syndicate and you will get up to 50 separate lines – four times every week – in the Thunderball draw on Wednesdays, Thursdays, Fridays and Saturdays for just 4 pence a line! As with the EuroMillions Syndicate and UK Lotto Syndicate – this will dramatically increase your chances of winning a substantial prize on the three times weeklyThunderball game. The Thunderball Syndicate from You Play We Play is also made up of a maximum of 50 syndicate members – once this is full a brand new syndicate is immediately formed. If a particular Thunderball Syndicate should not have enough places available – YouPlayWePlay will automatically rollover your entries into the next available syndicate – doubling your chances of winning the Thunderball jackpot. As with the other two games – you can choose your own favourite lottery numbers when playing in a UK Lottery Thunderball Syndicate with You Play We Play – meaning that you have full control over the numbers that you are playing with. If you prefer a completely random selection of numbers that’s no problem – you can use the You Play We Play Lucky Dip option to generate your Thunderball numbers using their random number generator. As with the EuroMillions and UK Lotto – you can play the Thunderball on a game-by-game basis as part of a You Play We Play lottery syndicate – without having to commit yourself to any sort of subscription. So, you can buy lottery tickets for the Thunderball for just 1 game if you wish – subscriptions for Thunderball syndicate entries are available for longer periods if you want them. The fourth major lottery syndicate offering that is available from YouPlayWePlay is the Health Lottery Syndicate. You Play We Play are the only lottery company in the world to offer players the chance to play Health Lottery as part of a lottery syndicate. You can play the UK Health Lottery game as a member of a YouPlayWePlay Health Lottery Syndicate and you will get up to 50 separate lines – five times every week – in the Health Lottery draw on Tuesdays, Wednesdays, Thursdays, Fridays and Saturdays for just 4 pence a line! . Just the same as the EuroMillions Syndicate, UK Lotto Syndicate and Thunderball Syndicate – this will vastly increase your chances of winning a substantial prize on the five times weekly Health Lottery game. The Health Lottery Syndicate from You Play We Play is also made up of a maximum of 50 syndicate members – once this is full a brand new syndicate is immediately formed. If a particular Health Lottery Syndicate should not have enough places available – YouPlayWePlay will automatically rollover your entries into the next available syndicate – doubling your chances of winning the Health Lottery jackpot. Just as with the other three lotteries – you can pick your own favourite lottery numbers when playing in a Health Lottery Syndicate with You Play We Play – meaning that you have complete control over the numbers that you will play with. If you prefer a completely random selection of numbers that’s no problem – you can use the You Play We Play Lucky Dip option to generate your Health Lottery numbers using their random number generator. The same as with the EuroMillions, UK Lotto and Thunderball – you can play the Health Lottery on a game-by-game basis as part of a You Play We Play lottery syndicate – without having to commit yourself to any sort of subscription or long term agreement. So, you can buy lottery tickets for the Health Lottery for just 1 game if you wish – subscriptions for Health Lotto syndicate entries are available for longer periods, though, should you want them. So there we have it – 4 separate lottery syndicates available from YouPlayWePlay – a successful combination of the two biggest UK Lottery games plus the largest European Lottery there is. With no other lotto syndicate company in the world that offers players the chance to take part in either a EuroMillions Syndciate, UK Lotto Syndcate, Thunderball Syndicate or Health Lottery Syndicate – we believe that You Play We Play ranks among the best lottery syndicate offerings available. 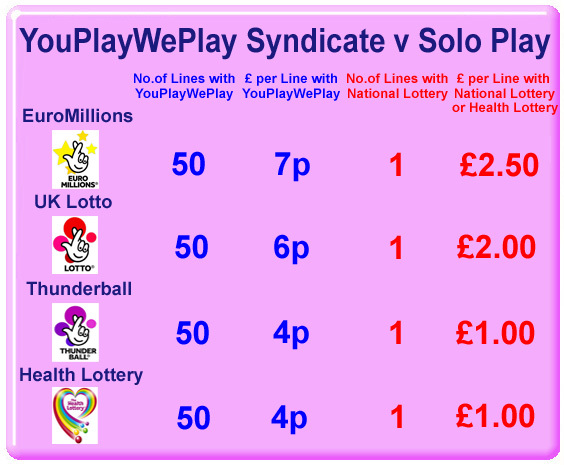 The table below shows just how you can benefit by playing the UK Lotto, EuroMillions, Thunderball or Health Lottery as part of a You Play We Play lottery syndicate – in comparison to playing the very same game on your own buying individual lottery tickets. From just 4 pence to 7 pence per line – we are sure you may agree that it offers a lot better value for money than is available by playing individually or indeed from many other lotto syndicates. Each of the lottery syndicates offered by You Play We Play are made up of a maximum of 50 people. This means that by playing as part of one of their lottery syndicates players can enjoy the vast benefits of massively enhanced purchasing power – strength in numbers – being in a position to acquire many more lottery tickets as part of the syndicate than most folk normally could alone. In summary – this works well on all levels – much better odds of winning the lottery, many more lottery tickets for your money and all in all a very good way to increase chances of winning lottery games like the EuroMillions, UK Lotto, Thunderball and Health Lottery.